Wedding Slideshow Studio can help you share your wedding photos in amazing slideshow videos or slideshow DVD. Especially designed as a wedding slideshow maker, it provides professional and beautiful wedding themes and DVD menus. With this wedding slideshow software, you can turn your wedding photos into a dynamic slideshow video with wedding music, wedding themes, dynamic transitions, Ken-Burns Effects and other effects. Then burn the wedding slideshow to DVD for watching on TV. Also you can export a wedding video for sharing on YouTune, Facebook. It supports kinds of video output formats for playing videos on mobile devices, such as iPad, iPhone, iPod, Samsung cellphone and other devices. Professional wedding themes and DVD menus. Wedding Slideshow Studio provides a set of pre-designed DVD munus for choosing. You can also customize the DVD menus with your own wedding photos, then add wedding music. Dynamic transitions, Pan&zoom effects. There are hundreds of transitions available for decorating your wedding slideshow. Pan&zoom effects can make the slideshow dynamic. Double-click a transition to apply it, then set its time. You can set different time for different transitions. It can help you easily control the slideshow time. Convert photos to slideshow videos. 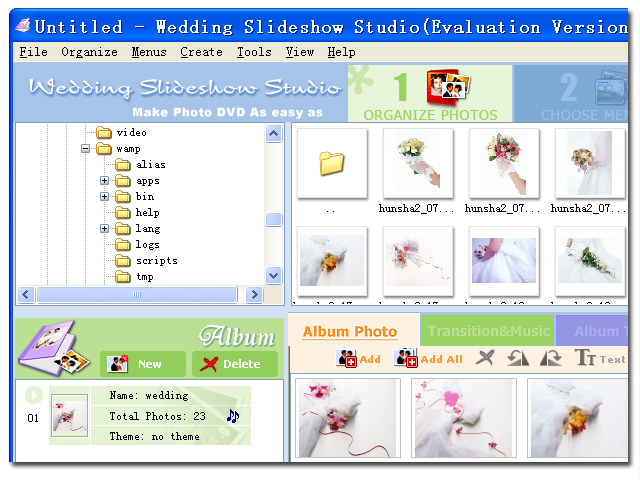 Wedding Slideshow Studio supports multiple video formats, such as mp4, avi, mov, mkv, swf, flv, mpg, and etc. So you can upload your wedding slideshow videos to Facebook and YouTube for sharing with friends. Also you can put it on your iPad, iPhone, PSP, iPod, Archos and other mobile devices for enjoying conveniently. Burn photos slideshow DVD/VCD/SVCD/Blu-ray Disc. With its built-in DVD burner, the slideshow software enables you to burn your wedding photo slideshow to DVD/ VCD/ SVCD easily. So you can watch your wedding photos on TV. 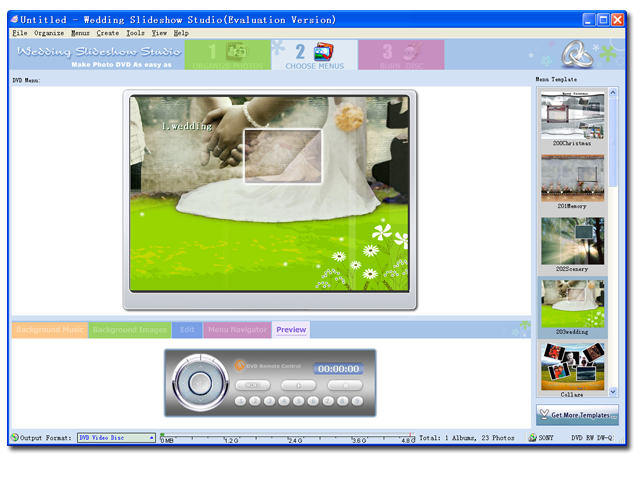 Screenshots of Wedding Slideshow Studio.